We all know wine makes a wonderful gift, yet we have a way to make it an extra sensational gift! All you need besides the wine is a block of your favorite local cheese and a package of these home-made nut crisps. 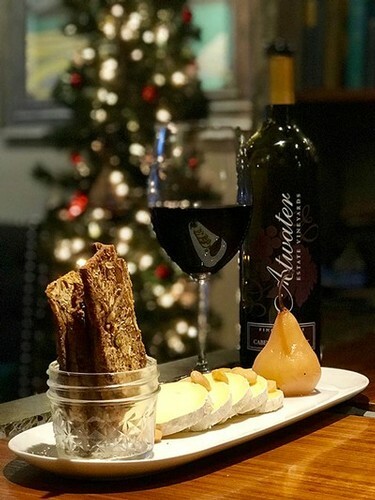 Often served at our wine bar GRAFT on their cheese plate, we asked Chef Christina McKeough to share this simple and versatile recipe that will complete your wine gift like no other! Preheat oven to 350. Butter/spray 1 pound loaf pan. Combine the flour, nuts, seeds and salt in bowl. In another bowl, whisk eggs and sugar together. Add flour mixture to eggs and combine. The batter will be very thick. Spoon into loaf pan, spreading out evenly. Bake for about 40 minutes, or until baked through. Take out to cool—but turn up oven to 400. Remove loaf from pan and let cool a bit more. Using serrated knife, slice into thin slices. Line slices on cookie sheets and brush with olive oil. Bake until crisp and toasted –about 5 minutes. When cool, wrap in your favorite vessel for giving as gifts. *Create countless variations to your liking—you can add dried fruit, spices and herbs, too.